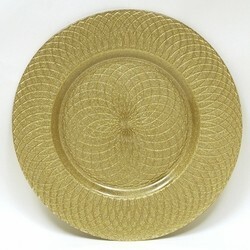 ChargeIt by Jay Spiral Gold Round Charger Plate 13"
Home > Products > ChargeIt by Jay Spiral Gold Round Charger Plate 13"
Elegantly present entrees and desserts on the ChargeIt by Jay Gold Spiral Round Charger Plate 13". Beautifully accented with mesmerizing gold spirals, this well-designed round charger plate provides the perfect harmony of beauty and form. Thanks to its solid glass construction, this high quality charger plate is exceptionally tough and durable. A must-have, this charger plate complements any upscale table setting and protects against spills and mess.